Further, Tracy shares a clever RC workaround to force a shorter timeout when using these cheap sensors. I should have waited! Now renaming the thread to "One Buck" . Buy the Ping))) and it'll work with all of our tutorials and examples without any consideration to wiring or code. And you'll have a warranty on replacement even if you blow it up. Remember, your hobby time is limited and it's valuable too. After you carve out your job, time for family, cleaning the house and paying bills you have your hobby so make that time effective by using the best hardware you can buy. Another PING plus (which Parallax should promote more IMO) is that Tracy Allen tested and noted that the PING's timeout (i.e., nothing detected) is a tad under 20 seconds, which makes it perfect for supporting the 20 ms refresh rate for CR servos. The dollar sensors' timeout is longer than 20 ms and will cause servo stutter. I didn't know this, but now I shall bring this detail to the surface! Can you point me to Tracy's link? 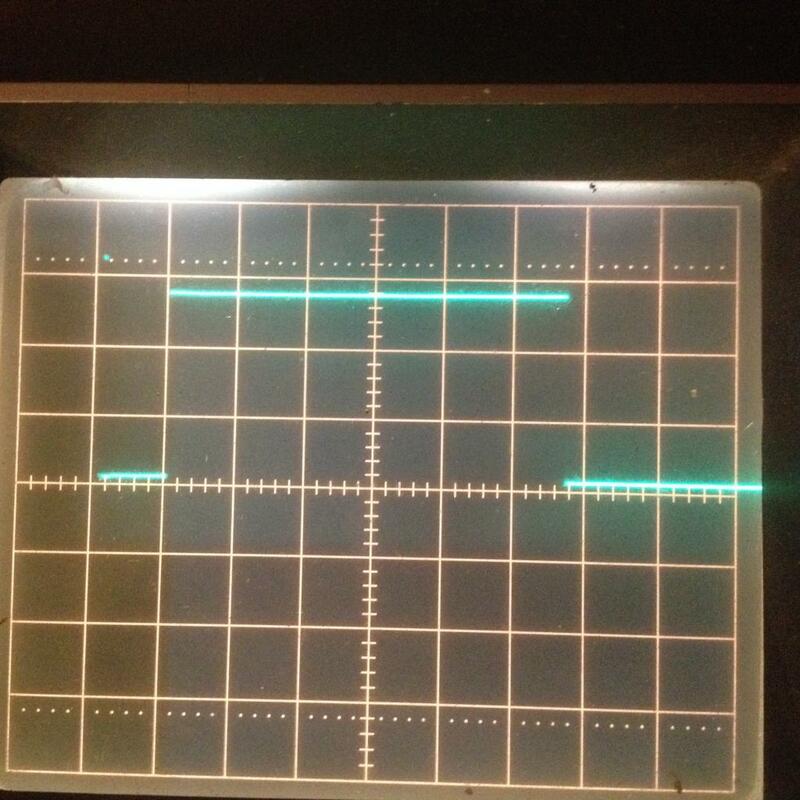 Maybe I'll be so lucky to find an oscilloscope screen shot or some proof I can use for an Insider post. As he writes, "Give +1 to Parallax." I finally succumbed to ordering a 10 pack of these HC-SR04 ultrasonic modules. Ordered them on Oct 30 and they arrived Nov 6th, free shipping and a total cost of $12.58. I did not expect to see them before Thanksgiving. Using a BS2 program I tested each of them and found 2 that would not return a distance even though I could hear both pinging. Looked closely at the SMD parts and found one resistor skewed so that only one end was actually soldered down. Using a toothpick I gently nudged all the parts and one of the transistors, a 1F, popped off completely. I carefully soldered the parts back on and that module is now working fine. The other one had no visible problems and all the SMD's were tight. Chalking that up as a DOA. BTW, has anyone else noticed that two of the three IC's have their ID info sanded off? I then set about setting them up to only require one I/O pin. With the BS2 it was easy using the setup on one of Erco's earlier posts. I/O pin direct to the Trigger and a 1.8K resister between Trigger and Echo. Worked like a charm. I found that I could use a resistor as high as 3.3K without any problems. When I went for 4.7K all I got were zeros. and display the data on an LCD. I'm including a pic of the scope trace, vertical is 1 Volt/div and horizontal is 0.5 ms/div. The trigger pulse is barely visible at the left and the positive pulse is the Echo from an object 50 cm away. 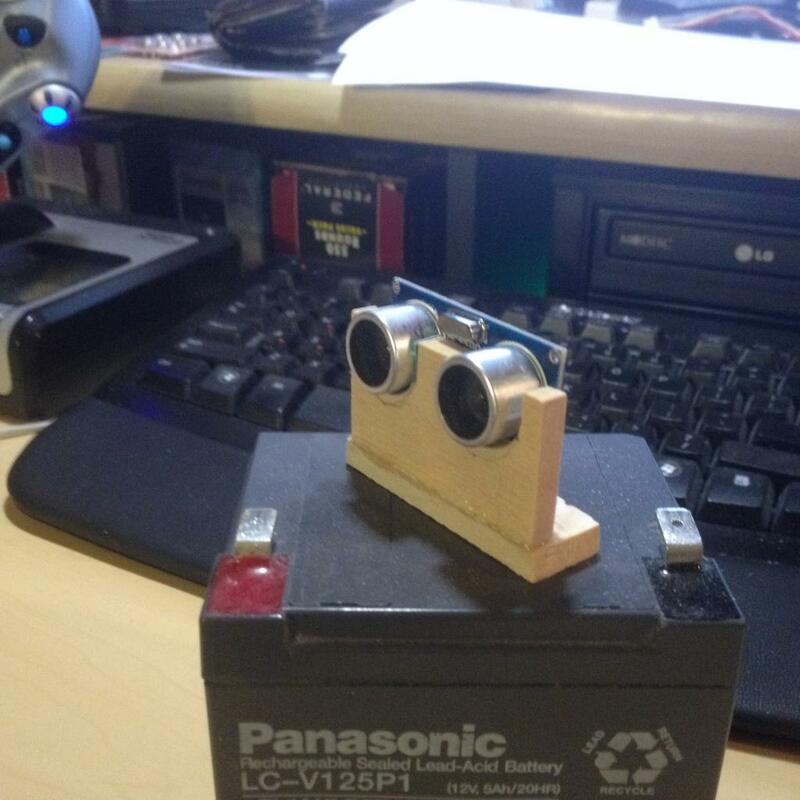 I also quickly fabricated a prototype mount for the pingers out of wood. Used a small sheet of 1/4" poplar board, cut two 5/8" slots about half an inch down and rounded out the bottom with a Dremel drum sander. Then glued a base to it so I can screw it down on the bot. EDIT: Taking a closer look at the scope measurements it appears that after the 10us trigger pulse there is about a 450us delay before the Echo pin goes high to start the measurement, seems like plenty of time to get the I/O pin into input mode. Great work, Hal, thanks for the very helpful info and documentation. Ditto to erco's thanks. Very useful information. I/O pin direct to the Trigger and a 1.8K resister between Trigger and Echo. Worked like a charm. I found that I could use a resistor as high as 3.3K without any problems. I was beating my head against the wall earlier today hooking up two of these sensors to a PicAxe (yeah, I know, serves me right). I assumed Hal's resistor range was OK for all processors. I didn't have any 1.8K resistors, so I used 2.2K. My rapid-fire sonar readings were mostly good, but at least once per second, there was a hiccup and the sensor returned a maximum timeout reading, which glitched my servos badly. Wasted an hour trying different code routines, then I swapped resistors to 1.7K (1.5K + 220R) and all was right with my data stream again. Note to self: buy some 1.8K resistors for that drawerful of ultrasonic sensors! Note to self #2: "Drawerful" blows spell check's mind. Use it daily to confound the computer network and possibly stave off Judgment day for another year or two. Wow, I would have bet money that "drawerful" was incorrectly spelled (my spell checker doesn't like it either), but I checked and that is indeed the right way to spell it. Interesting response to the varied resistor values by a different processor. More interesting response to "drawerful" - Firefox doesn't like it, Word doesn't like it but my iPhone has no problem with it and Pages has no problem with it. Firefox does accept "dwarfer" while both Apple products support the political correctness of discussing vertically challenged people with proper terms by rejecting that word. Just more junk food for thought! Thanks for your help. 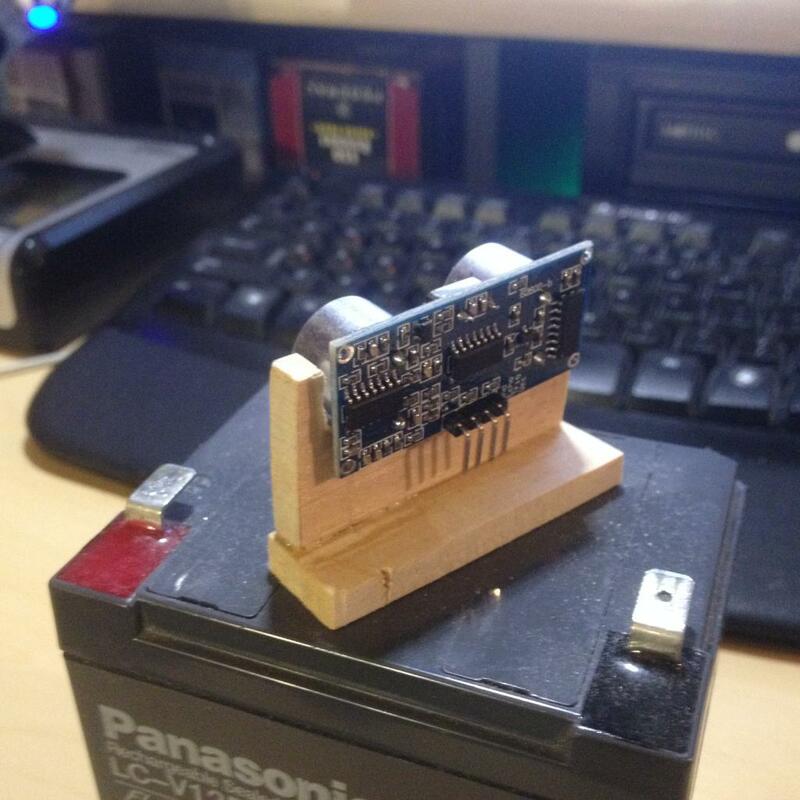 I bought the HY-SRF05 sensor, below I put the code I've tried and it work quite well . DEBUG HOME, "distancia = ", DEC5 Range ,"cm"
Welcome, mkeydiluffy. Glad to hear you got it working in standard 2-pin mode. Now try the one-pin mode, put a 1.8K resistor between trigger and echo, and use one I/O pin to trigger. Save a pin every chance you get! While you are sourcing and investigating ultrasonic sensors, don't forget to look for cheap underwater sensor devices! Waterproof, but I haven't tried underwater yet. Thx for you message, i will do it this afternoon, is a good advice for to use only one pin I/O. Sorry for my english writing im spanish and try to write myself without the help translator. One question, how i connect a resistor between trigger and echo? if in the connection of the mode 1, i see that the pin echo has to be free. Maybe the infomation of conexion about the mode 1 it not be good. I connect Vcc +5v, trigger pin I/O, echo whitout connection, OUT Vss(0v) and GND too. there are a lot of different versions of extremely cheap rebuilds of the HC-SR04 from china. They all have the same arrangement of piezo-transmitter, piezo-receiver and connectors. They differ in R's, C's and their placements on the board. Some even don't have a quartz. But the most important difference is the firmware, the program in the microcontroller. Most of these versions are working. In our project with schools we got three lots. a) 15 pieces with an error in the firmware using a "never-ending polling for a never coming echo"
c) 20 pieces for 0.98 EUR = 1.05 $ per piece (without separate transistors on board) working properly. Lot a) After sending the ultrasonic bursts to an object outside the detection range they wait in an endless loop for a response and ignore further triggers. A first way out is a short metallic tap to the receiver. Then short distances could be measured until you have a too far object . . . .
A curious strategy may cure this erroneous behavior: When there is no answer before timeout, then switch off the power for the HC-SR04 and repower it after a short delay. My modifications: Connect the Vcc-pin of the sensor with the collector of an additional pnp-Transistor. Connect the emitter of this transistor with the 5V of the arduino board and the base of this transistor via an 1k resistor to an additional controlPin. LOW at the controlPin switches the power on, HIGH switches off. A short HIGH pulse by a digitalWrite( controlPin, HIGH ) directly followed by a digitalWrite( controlPin, LOW ) is enough to reset the ultrasonic sensor. This reset must be done whenever the output of the functions ping() or pulseIn() is 0. So this software initiated hardware reset ends the infinite polling of the firmware in the controller. This strategy was successful for 14 sensors. The 15th needed a delay(1). Lot b) These sensors were not able to detect a reflected signal from a hand in 35 cm distance. The maximum distance of a hard reflecting medium was about 120 cm. I suppose unsufficient correlation between transmitted frequence and bandpass frequence due to tolerances of the used chip capacitors. The result of my analysis will be presented later. Of course the low price will limit my amount of time for modifications. Hello Ernest, thanks for you comment. Can you answer me some question?, How you connect the sensors? in mode 1 or 2?, and which programming language do you use?. Just 88 cents now. What madness is this! I don't know how they can make this stuff so cheap. I'm pretty sure they are factory seconds, maybe failed QC tests. Quality and range vary widely. I have modified many for 1-pin use. Some are OK, some (maybe 20%) just don't work at all. I just toss them, it's not worth troubleshooting. Hmmm... diet coke or two ultrasonic sensors? Tough call some days! A 5-pack of sensors for $4.19, less than a 6-pack of PBR. Each providing a different and necessary kind of fun. Has anyone tried the 2.0? I have some of the non-waterproof and they work great. The operating parameters are similar. The waterproof won't return an echo pulse. According to this page the 2.0 requires a pullup on TX/echo. FYI the trimpot on the board is to calibrate the distance measured. Maybe not, it seemed to work for a couple of mm. I wonder if it adjusts the modulation to eliminate crosstalk between modules. New self-contained $14 module with LED display (0-400cm) and adjustable min/max trigger output signals.